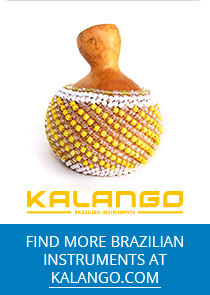 This brand from São Paulo is especially well known for its pandeiros. Senhor Walter, head of the company, is a passionate pandeiro player himself. His passion reflects in his instruments. A clear, balanced jingle sound, nice skins, excellent finish and very low weight are typical for the natural skin pandeiros. The concept of the 5-jingle pandeiros is an invention of O PROFISSIONAL. Flat rim for Pandeiro 10"